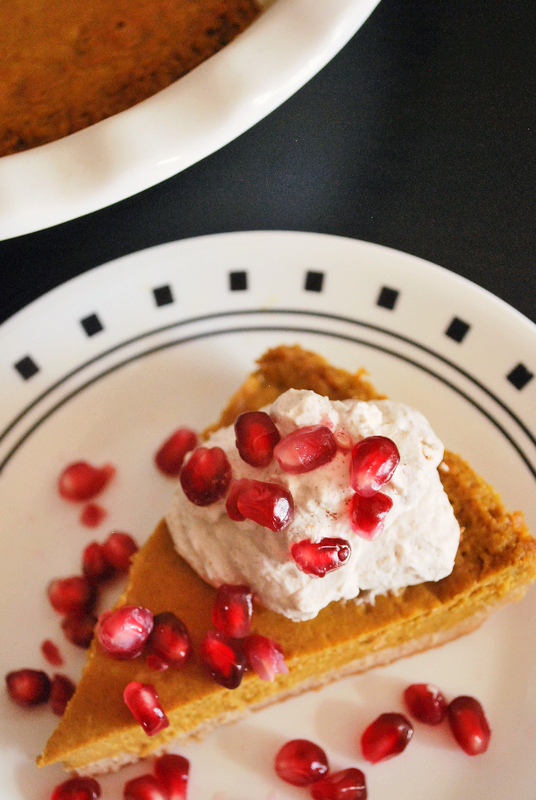 Allow me to tell you the story of how The Best Gluten Free Vegan Pumpkin Pie came to be. One bright and sunny day, a spunky food blogger decided it would be the day she would conquer one of her all-time favorite fall treats: the coveted pumpkin pie. She scoured the interwebs for a gluten free, vegan, and refined sugar-free version that tickled her fancy; however, all recipes seemed to come up short. She gathered a few random ingredients, pressed her crumbly graham cracker-esque crust into her pie pan, blended her 6-ingredient filling in the blender, and hoped. After allowing it to cool overnight and dreaming about sinking her teeth into that gloriously creamy pumpkin filling, the food blogger leapt out of bed and headed straight to the fridge. She sliced into her pie…and the texture was perfect. She removed a piece, and it looked perfect. She took a bite, and it was perfect. The miracle pumpkin pie. It happened in my kitchen. And it can (and totally should) happen in yours, too. I still cannot believe this simple 9-ingredient recipe is real. Like, it’s blowing my mind how freaking delicious this pie is. I know that a recipe that’s deemed “the best” definitely has some big shoes to fill; however, I firmly believe that this Gluten Free Vegan Pumpkin Pie can hold its ground against any other pumpkin pie out there. This pie is life-changing. How can you say no to that?! I’m so not a crust person. It’s the reason why I’m not a pie fan. However, when you throw together almond flour, coconut oil, cinnamon, and coconut sugar and call it a crust, I’m totally a crust person. It comes together like a soft, super-flavorful graham cracker crust, and it matches marvelously with our creamy, dreamy filling! Speaking of filling, this filling is what dreams are made of. OK…maybe it’s just what my dreams are made of. Regardless, this stuff seriously rocks. And it all comes together in a blender. Simply blend pumpkin puree, canned coconut milk, pumpkin pie spice, cinnamon, maple syrup, and coconut flour until well-combined. Then pour it into your par-baked crust and let the oven do the the heavy lifting! So easy. So creamy. So perfect! Be sure to check back here on Monday for my Pumpkin Spice Whipped Cream recipe! It’s the perfect accompaniment to fall’s favorite treat. Preheat the oven to 350 degrees F. Grease a pie plate with coconut oil. Set aside. Make the crust: Add almond flour, coconut oil, 1/2 tsp. cinnamon, and 1/2 Tbsp. coconut sugar to a food processor, and pulse until a coarse meal forms. When you squeeze it, it should be able to come together. Press your crust ingredients into the prepared pie plate. Be sure to press up the sides of the pie plate as well. Bake for 15 minutes. While the crust is baking, make the filling: Add pumpkin puree, coconut milk, pumpkin pie spice, 1 tsp. cinnamon, maple syrup, and coconut flour to a blender and blend until combined. When your crust is finished, carefully pour the filling mixture on top of the hot crust, and increase your oven temperature to 425 degrees F.
Immediately put your pie back in the oven for 15 minutes (no need to wait for it to come up to the new temperature). Then, decrease the temperature to 350 degrees F and bake an additional 30-40 minutes, or until the edges look browned. * It’s going to be bubbling. It’s going to look like a hot mess. But relax. It will all come together. Remove the pie from the oven and allow to cool to room temperature on a cooling rack, then place in the fridge to cool overnight. 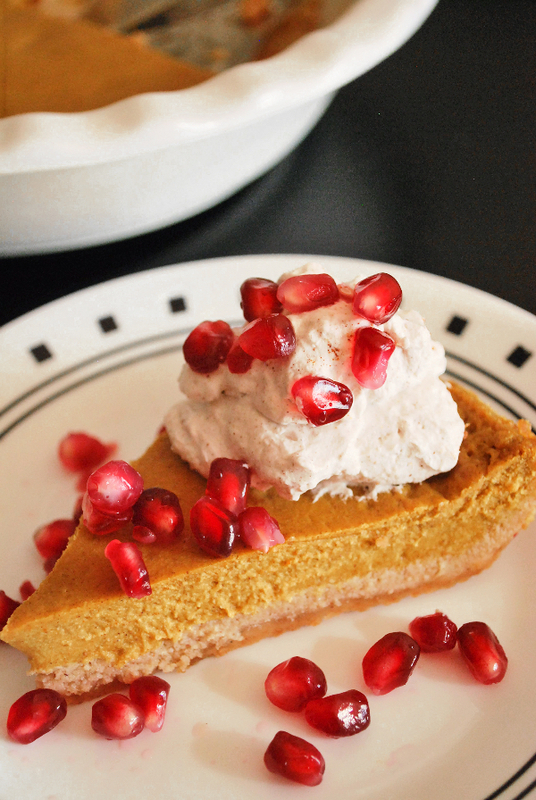 The next morning, serve with whipped cream and pomegranate seeds! *My edges got a little dark near the end of my cooking time, so I just carefully cut them off when the pie was completely cool. This was probably because my crust didn’t go all the way up my pie plate, so some of the filling was actually touching the plate. I definitely didn’t mind though. The dark edges tasted like a fall campfire. My crust recipe was adapted from the fabulous Texan Erin. Cooking times/temperatures were adapted from Libby’s. Love this recipe? I wanna see it! Be sure to tag your photos on social media with #fooduzzi so that I can see all of your wonderful whole food creations! Okay, this looks absolutely PERFECT! Definitely added this to my must-make-ASAP list!! Thanks, Emilie!! Let me know if you make it! OMG I am so excited that you put this together!! I am attending Thanksgiving at my boyfriend’s aunts place this year, and I’m sure no one will be making me a gluten free/dairy free pie. I’m going to try this and it will be my contribution!! This looks AMAZING! I can’t wait to make it when I go home for Thanksgiving. :) I love your blog! This looks so delicious! I love the pomegranate seeds, what a great addition! Thanks so much, Kellen! 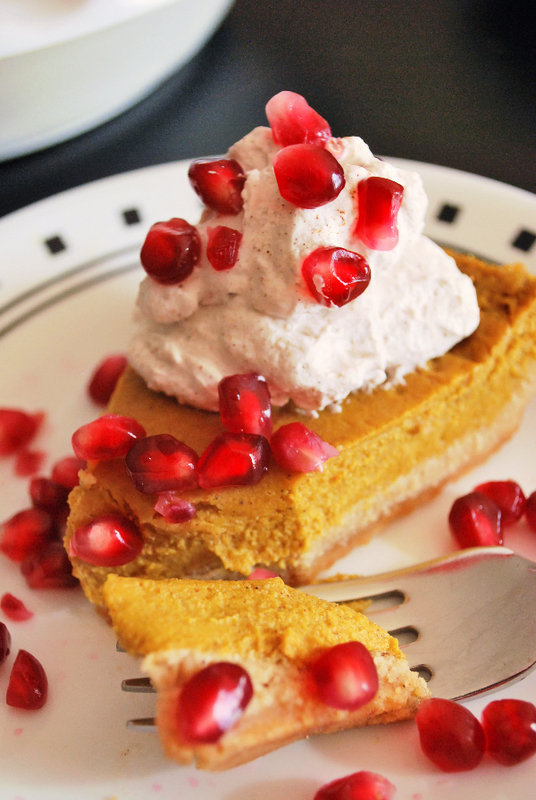 It’s the perfect compliment to pumpkin pie! Just made this. SO good!